Photo Collages are a popular thing today. They are easily displayed, versatile, and creative. I love projects like this as they incorporate all my favorite things about photography and people. Misha’s photography can make a special collage from your favorite photos as a uniquely special gift to that special person or family member. Or, you can set up a session and have a collage done from your session photos. Have FUN! The art of photos is ever changing as is the journey of life. Enjoy! Author misha00lowtherPosted on February 21, 2012 February 21, 2012 Categories photography, etc.Tags 2012, art, collage, creative photos, etc., graphics, misha, mishas photography, photo blog, photographic experience, photography, photography and restoration, photography blog, photos, portraitsLeave a comment on Photo FUN! The most romantic, exotic room in T-town! Tulsa is a wonderful place. I have lived here throughout most of my life and amazingly enough, I am still finding out things I didn’t know about Tulsa, OK — the place I grew up….. If you are looking for a quaint, cozy, warm, romantic evening to share with your sweetheart….here is just the ticket for you! I recently visited the “Inn at Woodward Park”. It’s right off of 21st street across from Woodward park located between Peoria and Utica. This little bed and breakfast is marvelous! It has four rooms available for guest use. The Moroccan room is bold and exotic decorated with vivid blues, passionate reds and fabulous golds. It’s right out of a dream….think Arabian Nights, Sinbad….or any pirate you like (such as Jack Sparrow even)…. The innkeeper is a wonderful lady. Her name is Janet. She is very sweet, polite, accommodating and informative. The Inn has a beautiful sunroom upstairs where you can enjoy coffee, or other refreshments as well as a formal dinning room for breakfast. You may also wish to opt for breakfast in bed….adds to the romanceIi mentioned earlier. After all, we are talking “Valentine’s Day”. Speaking of Romance…there is even a romance package that gives you wine (chilled) and cheeses and fruits all ready and waiting for your arrival if you order this when you reserve your stay at the Inn. I had a glorious time relaxing in a jacussi tub and a four poster bed complete with curtains and a wonderful imagination….Use your imagination this Valentine’s Day and let The Inn at Woodward Park help you celebrate with your special Valentine! One more wonderful thing about this inn…..it is soooooooo close to many dinning options…. Olive Garden at Utica Square, Polo Grill at Utica Square, P F Changs also at Utica Square….are not even one mile down the road! Isn’t that spectacular?? Cherry Street with its shops and dinning options is just around the corner too! Cherry Street is the area on Fifteenth Street between Utica and Peoria in Tulsa. Plenty of Romance in the area….and a stroll through the park is great too….though the weather for this area has gone into winter for the week….Mother Nature decided to make winter snuggle weather for Valentine’s Day….imagine!! Happy Valentine’s Day everyone!! Whatever you decide to do, I hope you enjoy it with someone special! This past weekend, I was fortunate to visit the Royal Gauntlet facility located in Coweta, OK. Royal Gauntlet is a rehabilitation and education facility for birds of prey. Royal Gauntlet seems to attract the young adults of today which greatly increases the awareness factor for the future. So many young adults seem to be immersed in video games or the internet that nature and God’s creatures seem to take no seat at all unless they are part of the game. It is great to see exceptions while visiting the facilities. Royal Gauntlet also does the Bird of Prey show at the Castle of Muskogee every weekend in May. If you are into education and birds of prey, this is worth checking out! Royal Gauntlet is very proud of their Eurasian Eagle Owl. He is called “Ritual” and it is amazing to see this owl fly! 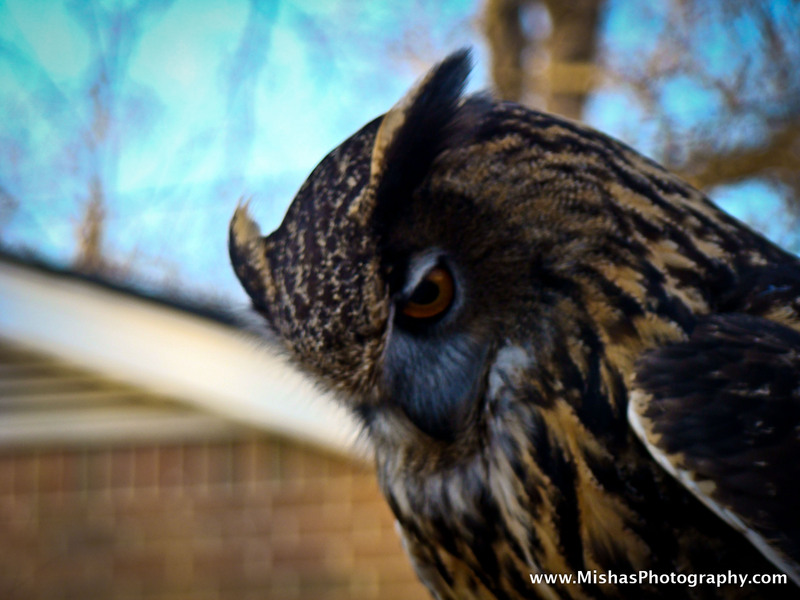 Eurasian Eagle Owls are the largest owl species on the planet and at the age of maturity, their eyes turn red! I can not wait to see Ritual reach that stage. He is a most amazing creature and I feel incredibly blessed to have seen him at such a vantage point! Royal Gauntlet currently has a beautiful representation of birds of prey. Harris hawks, Red-tailed hawks, three varieties of falcons, and three varieties of owls. I can’t wait until the fair arrives at the Castle of Muskogee so I can show you more of Royal Gauntlet and their birds. See you again next week for the next update!